This look is romantic and colorful. It works on a large patio area where you have lots of room to plant and grow potted flowers. As you can see in the photo is also works where space is limited and you must utilize every inch. Enjoy a early morning cup of coffee sitting at this table or a romantic dinner for two. Either way this look is sure to please. The pink is a popular bloodleaf grown mostly for foliage, loves full sun. Next is the arrow shaped saliva leaves that will open to spires of long purple flowers. Then comes the blue Brazilian verbena already in flower and shown inside a terracotta clay rectangle planter. We love this flower. The climber on the trellis is a showy pink mandevilla vine that flaunts gorgeous trumpet shaped flowers as the vine scales the wall. 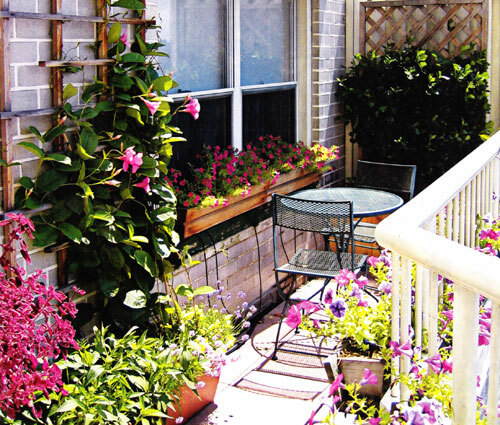 The window box planter on the window is filled with shade tolerant pink impatiens. These are so popular and great for garden containers of all sizes. The dark green climber on the back trellis is a green glossy gardenia leaf that will bloom a white blossom and the smell is heavenly. Lastly are the planter boxes along the railing that are filled with the love annuals called petunias in a mix of pinks and purples. See how easy this is to create - give it a go and tell us how it worked for you! Read more.....Balconies and window tips.